We were in Wabasha the other weekend and found a fun restaurant for lunch, Stacy’s Kitchen. The decor was right up my alley. Fully themed for the SeptOctober Fest the rest of the town was participating in. I’m not sure if they are decorated that way year round or not. If they aren’t, they should! It was great. My daughter and I had more fun checking out their collection of Halloween themed art/photos and decor. It had a small, cozy feel with a twist of Halloween. They had more of the traditional American comfort foods, plus breakfast all day. The service was great. Immediately after walking in, we were greeted and they offered us a high chair. We all ordered something different. My husband got a cheeseburger, my daughter pancakes and my son a hotdog. I ate probably the best BLT I’ve ever had. I could not believe how friendly the service was there. They got our order in right away and food was out within what seemed like minute. I think it was the first time ever that we all cleared our plates. Even though the place started to fill up at lunch time the server never seemed to miss a beat. Everything was really well priced and the portions sizes were spot on. 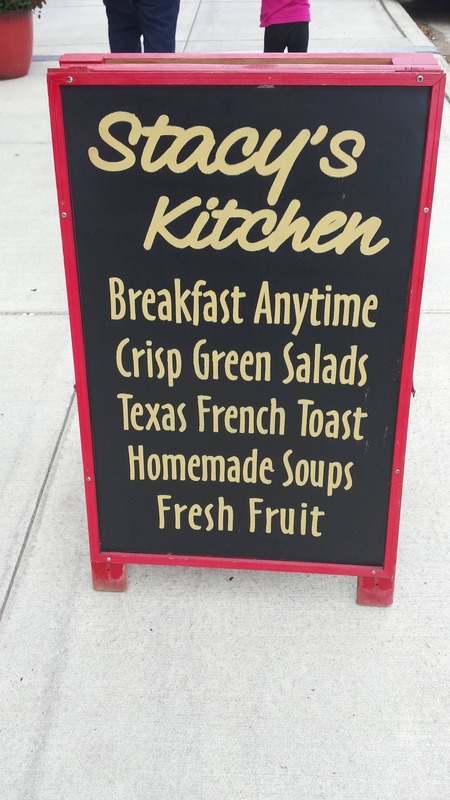 One thing to note is that they do not serve soups on Sundays, but they do have breakfast all day long so who cares! If I’m ever in the area again, I would defiantly stop by. Just taking a peak on their facebook site, I may be a little more adventurous on my food selection next time. It all looks great!